Deborah Moss works from her country studio beside an exquisite native forest in North Auckland which provides endless inspiration for her creative practice. Working mostly with paint, she begins each piece with expressive marks which mirror her dynamic surroundings. Layers and colours in this stage are applied playfully - inviting a more considered response as the dialogue between gestures and storytelling evolves. The hard surface of the wood she typically works on enables her to experiment with texture and a variety of non-conventional tools to add depth and interest in her paintings. She strives to create contrasts between considered and 'freestyle' marks; light and dark, space and active areas but above all - a passionate response to her muse in her chosen medium. 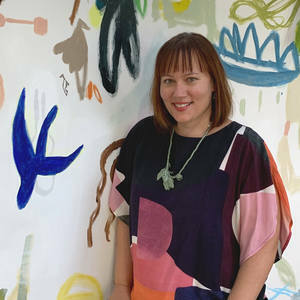 ​The artist has exhibited throughout New Zealand and her works are held in private collections in New Zealand and the United States, Singapore, England and Australia. She was a finalist in the Fieldays No. 8 Wire National Art Award, ArtsPost/Waikato Museum, 2016. Every time Deborah sells an original artwork, a native tree is planted on her property as part of her “Planting hope” initiative to help the environment. Graduate of the "Creative Visionary Mentoring Program" facilitated by established artist and art teacher Nicholas Wilton (USA), 2018. The Other Art Fair Melbourne presented by Saatchi Art (The Facility), May 2 - May 5, 2019. Art auction fundraiser for the Maori Women's Welfare League (Perth), Nyisztor Gallery, Melville, Australia. Nov 23, 2018. Featuring works by invited NZ artists including Shane Hansen, Tracey Tawhiao, Mere Clifford and Australian artists Sandra Hill, Tony Albert and Julie Gough. ​Animals - Seeing the Sentient Being, live art auction hosted by Direct Animal Action to raise funds for Paws Awhile animal sanctuary in Raglan, Allpress Studio, Auckland. Works by 30 established and emerging New Zealand artists. November 29 - December 1, 2016. ​Mt Albert Grammar Fine Art Show featuring work from over 130 established and emerging New Zealand artists, Auckland, August 19 - 21, 2016.